Thursday April 1st 1909 I was busy with the work all forenoon. had church and baking to do. I walked up to Mrs [illegible] in the afternoon She gave me such a pretty [illegible] [mat?]. Will was hauling straw from an old stock in the field to fill ditches. They turned on the electric light in Coralville tonight Friday April 2 1909 I did a lot of work, sweeping & washing windows in forenoon I gave the kitchen a good cleaning after dinner and then went down to Mrs Robinsons awhile. I got the supper over and read all the evening to finish "[illegible]" It snowed this morning Ott got home from Dakota had a hard trip. came home about sick. 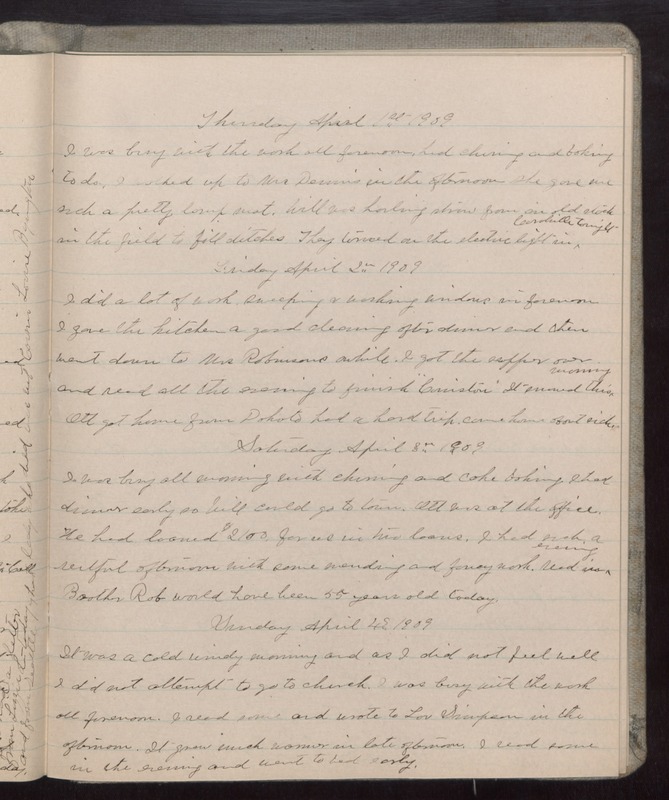 Saturday April 3 1909 I was busy all morning with churning and cake baking I had dinner early so Will could go to town. Ott was at the office. He had loaned $100 for us in two loans. I had such a restful afternoon with some mending and fancy work. Read in evening. Brother Rob would have been 55 years old today. Sunday April 4 1909 It was a cold windy morning and as I did not feel well I did not attempt to go to church. I was busy with the work all forenoon. I read some and wrote to Lou Simpson in the afternoon. It grew much warmer in later afternoon. I read some in the evening and went to bed early.